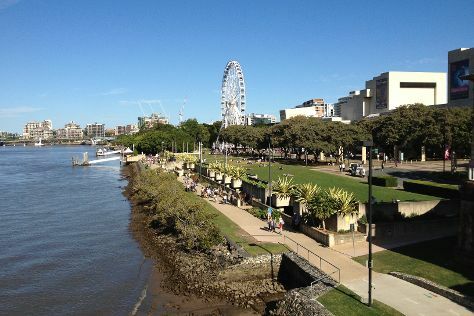 Brisbane is known for parks, wildlife, museums, nightlife, and nature. Your plan includes some of its best attractions: let little ones run wild at South Bank Parklands, look for all kinds of wild species at Lone Pine Koala Sanctuary, get in on the family fun at Wheel of Brisbane, and admire the masterpieces at Gallery of Modern Art. For more things to do, ratings, and other tourist information, read our Brisbane tour builder website . Singapore, Singapore to Brisbane is an approximately 11-hour flight. You can also do a combination of flight and bus; or do a combination of bus and flight. Due to the time zone difference, you'll lose 2 hours traveling from Singapore to Brisbane. Traveling from Singapore in May, expect nights in Brisbane to be much colder, around 15°C, while days are little chillier, around 27°C. 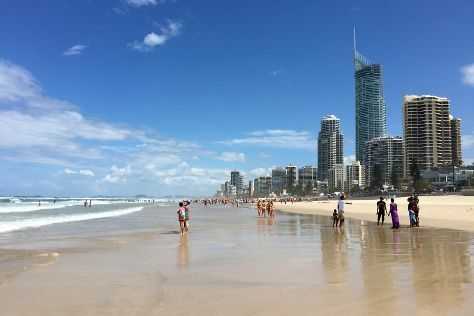 Finish up your sightseeing early on the 23rd (Thu) so you can go by car to Gold Coast. On the 23rd (Thu), try out the rides at Sea World Theme Park. Get ready for a full day of sightseeing on the 24th (Fri): get in on the family fun at Warner Bros. Movie World, kick back and relax at Surfers Paradise Beach, and then get in on the family fun at Infinity Attraction. To find other places to visit, ratings, reviews, and more tourist information, use the Gold Coast tour itinerary planning site . Traveling by car from Brisbane to Gold Coast takes an hour. Alternatively, you can take a bus; or take a train. Expect a daytime high around 27°C in May, and nighttime lows around 15°C. You'll have a few hours on the 25th (Sat) to wrap things up before traveling home.